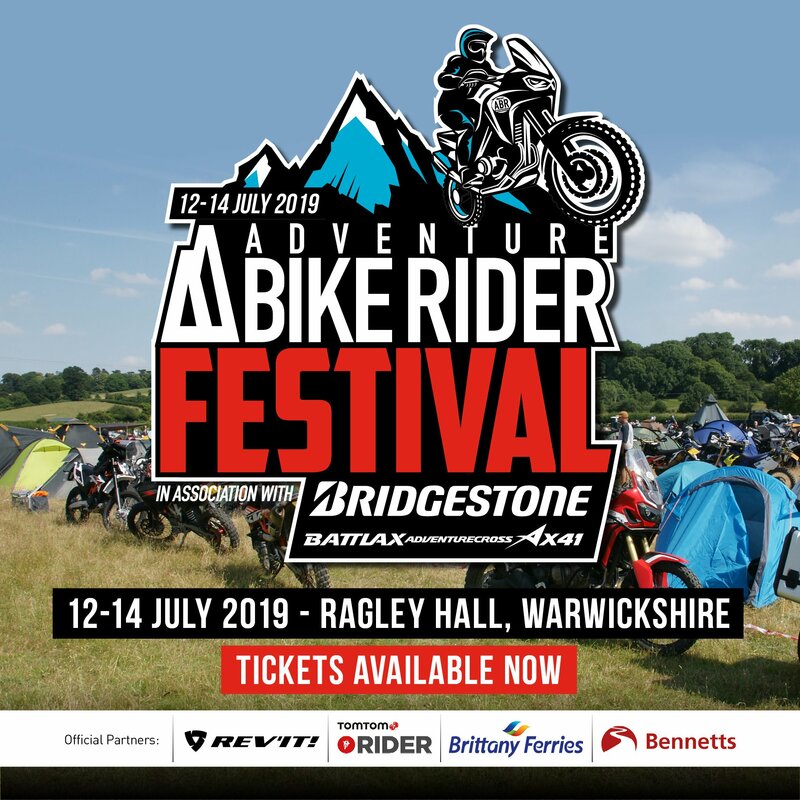 In an increasingly packed market place, launching yet another adventure bike can be a risky endeavour for any manufacturer. With a host of other brands and interpretations of the same theme filling the showrooms across the globe, getting the motorcycling industry to show genuine enthusiasm for your latest creation is a tough gig. 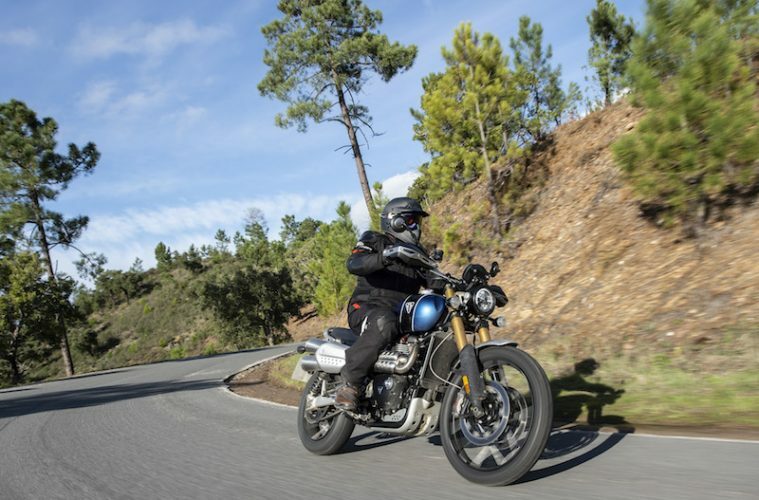 Yet for the launch of the new Triumph Scrambler 1200, journalists from as far afield as Tokyo and Toronto had eagerly flocked to the week-long event in the stunning setting of southern Portugal. And, as soon as you set eyes on the new bike, it’s immediately obvious just why. 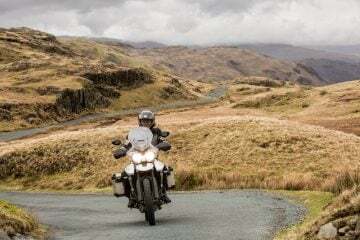 Not because the 1200 is totally different to anything else in the adventure sector, not because it harks back to classic scramblers from back in the day, not even because it’s great to see a British brand at the forefront of the industry. No, it’s because it just looks so good sparkling under the winter sun. From the deep paint of the sculpted tanks to the sweep of the twin exhausts, the 1200 Scrambler is one sweet ride and every single person at the launch couldn’t wait to fire it up and twist that throttle. 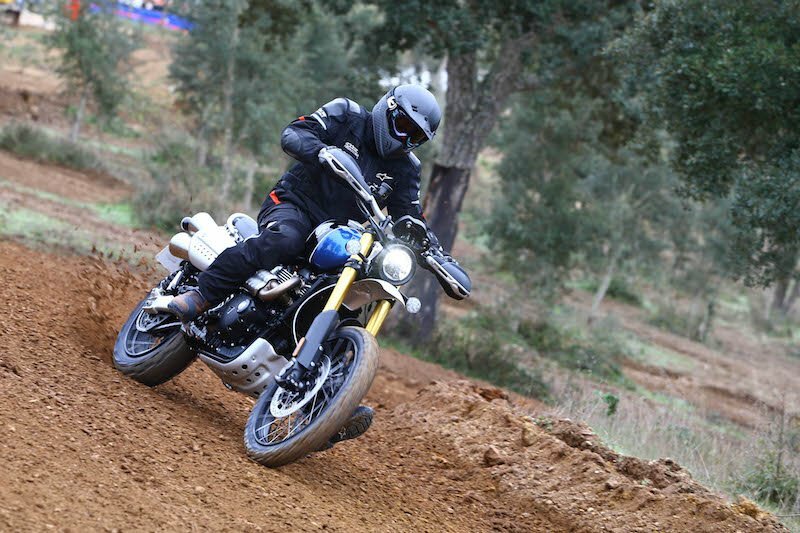 After the success of the updated Street Scrambler back in 2016, it was always on the cards that Triumph might up the ante with a bigger capacity bike with slightly more off-road capability, and that’s exactly what the company has done with the new 1200. After grabbing the big twin motor from the Thruxton and spending some time fettling it for less weight and more torque, the boys from Hinckley have fashioned an entirely new frame around the lump, with the focus firmly on both dirt and blacktop. Taking inspiration from the Baja bikes ridden by Steve McQueen and Bud Ekins, the bike, which is available in an XC or XE model with prices starting from £11,500, has been dressed in full retro scrambler clothes, from the specially commissioned Ohlins piggy-back shocks at the back to the bench seat above them. The tank looks like it could have come straight from a 70s Bonneville, and as for those high-swept twin pipes and that heavenly noise they emit, you’d have to hate bikes not to fall immediately in love with this one. But don’t think this is just a retro pastiche cobbled together to jump on a wave of nostalgia for old bikes and yard-built specials. 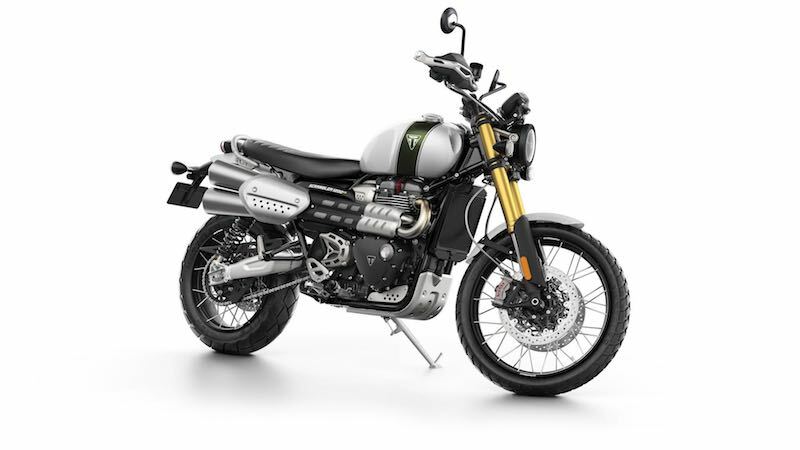 Undoubtedly Triumph has had an eye on market trends and the Scrambler 1200 will find plenty of fans within the lumberjack-shirted beardies in Hoxton, but to dismiss the bike as an unsophisticated urban trinket would be both unfair and inaccurate. The Triumph Scrambler 1200 manages to capture the style and cool of those halcyon days, but then bring it bang up to date with all the latest tech that modern buyers both want and expect. From the selectable riding modes and the gyroscopically controlled cornering ABS, to the GP standard radial calipers and top end Show USD forks. The clocks might look like a classic Smiths, but that’s a full TFT screen with customisable graphics – the headlight could be a Bates from 1967, but it’s an LED unit that lights up the night sky like a beacon. And if all that were not enough, the Triumph Scrambler 1200 also marks the start of unique partnerships between the historic marque and two very modern brands. By the time the bikes are in the showrooms in summer 2019, you will be able to control your GoPro camera through the bike’s switchgear as you ride via a clever Bluetooth link. 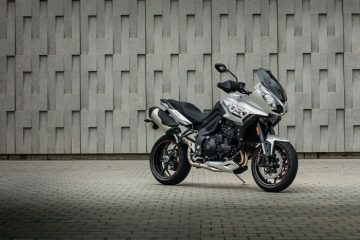 And to get you to your destination, Triumph has also teamed up with Google to integrate a bespoke navigation system into that TFT screen. This is cutting edge tech and it shows the firm’s determination to be market leaders, not followers. 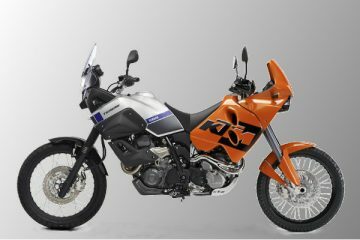 So, is it really an adventure bike? 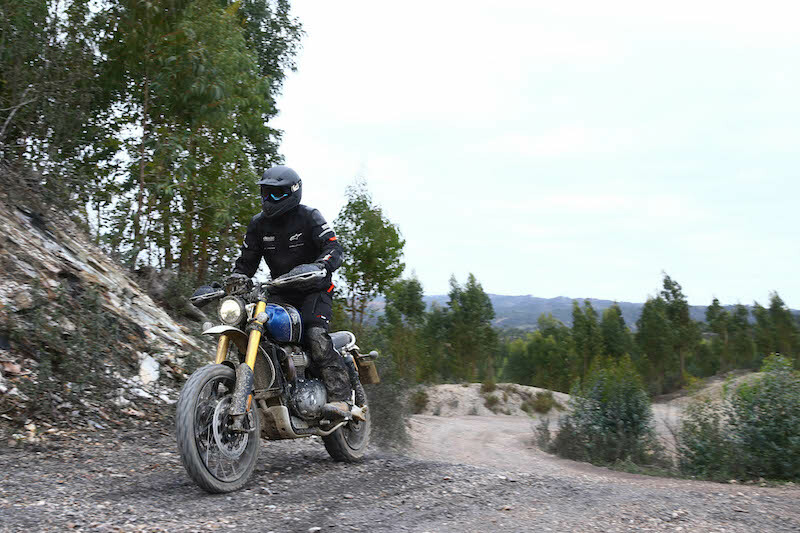 Well, Triumph is calling the Scrambler 1200 a ‘modern classic adventure bike’, shrewdly creating their own genre within the adventure sector. 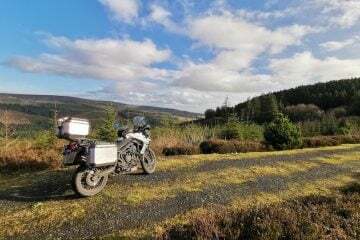 Compared to the likes of the BMW R 1250 GSA, the KTM 1290 Super Adventure or indeed its own Tiger 1200, the Scrambler is indeed a very different proposition to the adventure bikes we’ve become accustomed to. But that’s not necessarily a bad thing – what matters is how the bike actually performs and whether it can cut the mustard against the established market leaders. You can read the full review of the Triumph Scrambler 1200 in the March/April edition of Adventure Bike Rider, but here’s the spoiler alert – we loved it!